Context Menu Tuner is an application which allows you to customize Explorer's context menu in Windows 7, 8 and 8.1. Along with fully customizable commands, it allows you to add any ribbon command to the Explorer context menu. Ability to add ANY Ribbon command to the context menu of any file, folder, desktop or/and specific file type. This includes even commands which are not added to the ribbon by default. Ability to add a custom command to the context menu of any file, folder, desktop or/and specific file type. You can specify the title and icon for the context menu item and add command line arguments for the application you use. - you can tweak the context menu item to be shown only if SHIFT key is pressed on the keyboard. 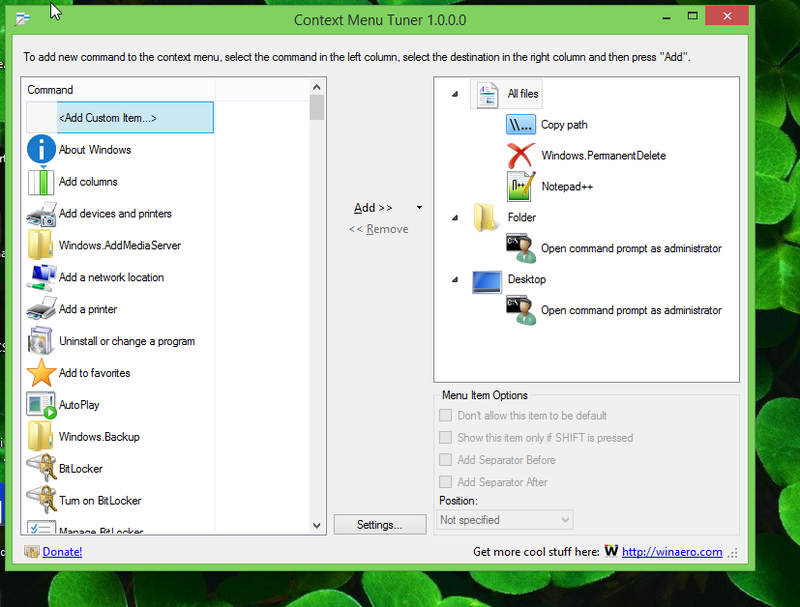 Context Menu Tuner supports all editions of Windows 7, Windows 8 and Windows 8.1. It is the portable application and does not require to be installed. Windows 7 users have to install .NET Framework 4.5 to get this app working. Great job on this application, thanks. Great job hb860, as always! Looks useful but I'm confused what to add to my context menu? Everything I need is on my taskbar, as a quick launch menu. Use tabskbar for managing currently running programs and add important commands and shortcuts to context menu. i used to do this in Windows XP. Context Menu Tuner 3.0 is out. +The ability to add commands to the drive context menu. +The tooltip of a Ribbon command in the list contains the command name. 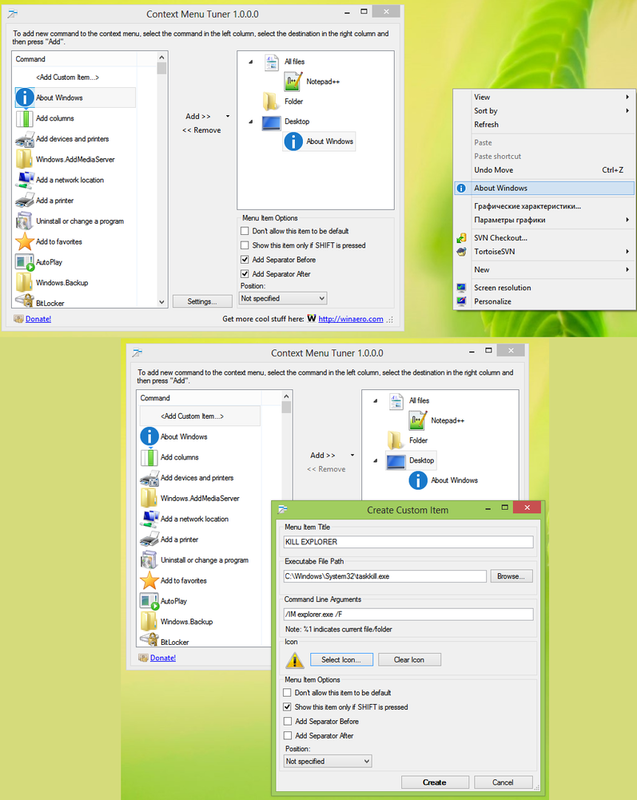 +The application got a black list with commands which affect the stability of File Explorer. 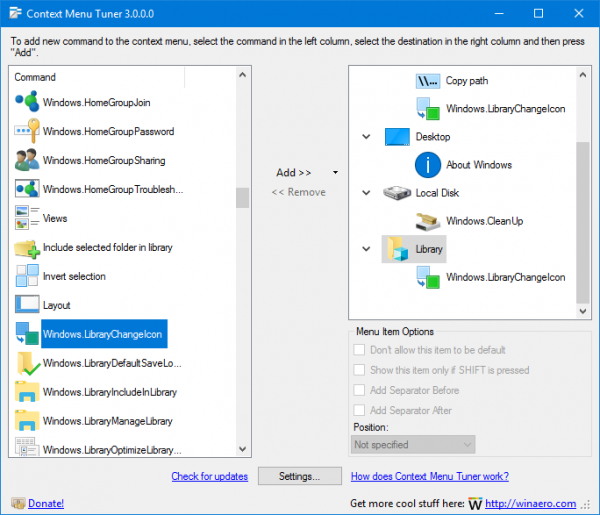 If you found out that some command causes crashes of File Explorer once you added it to the context menu, tell please which command it was in the comments. I will add to the black list and it won't appear in the list of available commands any more.